Oh No! DMC - the makers of most of the thread Lana uses to Cross Stitch - is declaring bankruptcy. This article is translated from the French. This is the official press release from DMC on 24 April 2008, telling us they will "undertake significant restructuring in the near term". This apparently meant not paying April's wages to their workers in France. That is a surefire way to kill the business, combined with the news report confirming the bankruptcy. DMC's press release from February announces a new "Strategy" which seems to have been too little too late. The press release mentioned the 2007 results would be published in March but the figures still haven't surfaced. DMC's official website is saying nothing else at the moment. DMC is a major supplier of threads for Cross stitching, either as individual skeins, packed in kits, or providing the source materials for custom thread dyers. What does this mean for Cross stitchers (like Lana and her mum)? Other thread suppliers should enjoy the opening market opportunities but they don't have the wide range of DMC. This means there will be a while before new colours are in place to replace the DMC colours. Thread prices will probably go up. Less competition will mean thread makers have a chance of making better margins. Ah well. Interesting times ahead! Update: DMC issued a declaration (in French) saying that they have a cash shortage caused by everyone else but them (the economy, currency, competition, etc) and have gone to the court and it's now in the courts hands. A decision will be handed down in the first few days of May. At least that is my translation based on the Alta Vista Babelfish French to English translation. We have always wanted to know the names of the stars looking down on us and it has always seemed too difficult. Until now. Go to Stellarium and download the version that matches your operating system. Then go to the setup area and enter what the Longitude and Latitude and altitude of your home and enter it in. If you don't know them, just type "[Yourhome] Latitude longitude" in Google and you should get a number of results. Now you will see the sky as it should appear to you at the current time. It constantly updates based on the computer's clock. Absolutely marvellous. We installed it on one of our laptops and then went outside and matched up Mars, Pollux, Saturn and lots more. Now stargazing is much easier! This little girl has always been more interested in reading than almost anything else. 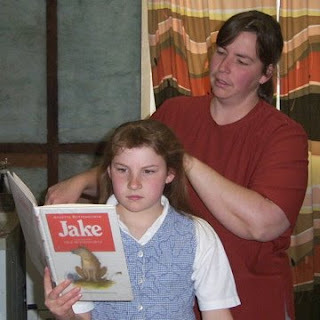 She wouldn't put the book down even when Lana was fixing up her hair when she was nine years old. Now look at her. She is in my car, in my seat, beginning some lessons on how to drive. It's not that she wants to drive, but this will give her the chance to go where she really wants to go. Where? The library, if you hadn't guessed. Today was just turning on the car and working out which of the pedals is the clutch, brake and accelerator. The first lesson went well. We just drove around the back yard. Lana and all the other children were on the back deck watching carefully. When Ariel pressed the brake rather than the accelerator and I went flying forward, arms flapping about, there was great amusement from all watching. They're still laughing as I write this! Next time I will wear my seatbelt. Even if it is just in the back yard! The laughter was at me, not at Ariel's driving. Typical! Now this is the start of another stage of our bonding. She has driven me crazy in the past and now she will get to drive me all over the place. Deep breath. In, wait and out. Off we go! Since our last photo showing the beginning of our project, we have come to this. 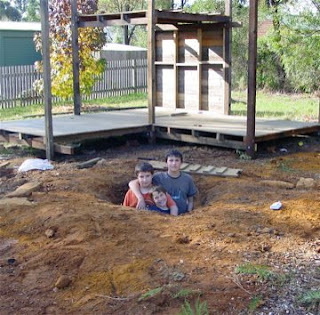 A nice deep hole which the boys have finished digging. And the framework for the main fort, with ground floor and upper floor completed. Unfortunately we have had rain, sickness and other distractions, but so far so good. The second level allows for adults to stand on the lower area - so long as they watch their head. Next we will be finishing the walls and upper turrets and roof. Also we will be timing when to put in the pole with it's concrete supports. We celebrated Martin's first birthday this weekend. Yes, it has already been one year since his rather dramatic entry into the world. 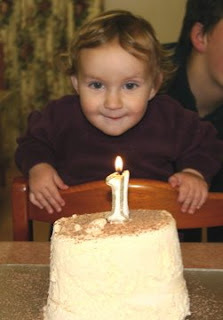 Despite our best efforts he hadn't quite grasped the concept of blowing out the candle. Grabbing it and trying to eat it he had down pat, but blowing was an advanced concept. However, he did enjoy everyone singing "Happy Birthday". I suspect it was because he realised the song was always followed by yummy food. Lana made a cake to share with the locals at the village store on Saturday. A customer tasted some of the birthday cake and saw Lana nursing Martin. She asked Lana, "Did you make this cake?" "You should cook professionally. It is very nice." "I actually make the muffins for the store." The customer looked at Martin and suggested, "I suppose you probably wouldn't have the time." "Oh, I have more at home," Lana replied casually. "Oh have you?" the customer politely enquired. The rest of the regulars listened in with interest as they could sense what was coming. "There's five more at home." Lana replied. "YOU HAVE SIX?" the customer answered with her jaw open. "No, seven," Lana replied, pointing to Rose sitting beside her drinking a milkshake, "Rose is mine too." All Lana got was a shocked look and an "Ohhhh." You just can't buy that type of fun. We have been enjoying watching "I Dream of Jeannie" episodes. We picked up a collection of DVDs containing all the episodes from series 1 to 3. This is part of the "Cultural Appreciation Studies" module of our curriculum. 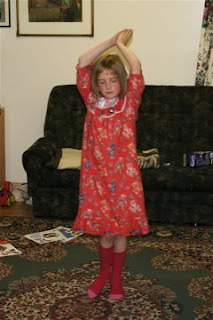 This photo shows Clare demonstrating the opening sequence where Jeannie does her belly dance. "I'm not wearing her silly clothes, but I do like the dance," Clare told us. Meanwhile Rose has taken to folding her arms and then bobbing her head and announcing, "Bing! You beard." [You now have a beard] or "Bing! You long hair!" In unrelated children's tales, Rose often awakes early in the morning to go to the bathroom and on the way back she detours into our room and ends up in our bed. I quizzed her about this the other morning and said, "Why are you in my bed?" "Big bed for sharing!" she quickly replied. Yesterday we awoke to find Rose NOT in our bed. When I saw her I asked, "Why weren't you in my bed last night?" In response to a commenter's request, here is a photo of the plan we created for the playground. You could call this the beta version or mock up. This gave our neighbour an idea of what we wanted. "That's good. But what about ..." and off we went with what is known in the industry as "feature creep". - little shop (with Rose's Lego figure waving to us). - the corner tower will be a larger L shape. It should all work pretty cost effective as we are using recycled hardwood timber. The mission is to create a playground good for our children but also their children when they visit. This is going to be a multi generational playground so we have to build it tough. When we first moved to our property it was a vacant block with four big pine trees. We moved an old army barracks for living space and attached a septic system, power and water tanks. But there wasn't much space so Lana and I bought some wood and swing bits and made a simple playground. That way Lana would be able to say "Get out and play!" when everyone was getting stir crazy. That playground didn't weather very well and was pulled down and we had an old plastic playground obtained from a fast food chain which upgraded their playground. This was fine, but the children would appreciate a swing and better climbing bits. So, now that a neighbour is able to help we are upgrading our playground. The first step was designing a sample using Lego. This gave us all a chance to add ideas and discuss options. When our neighbour saw the plan he asked in astonishment, "How big is this playground?" "About 30 foot square." we answered. 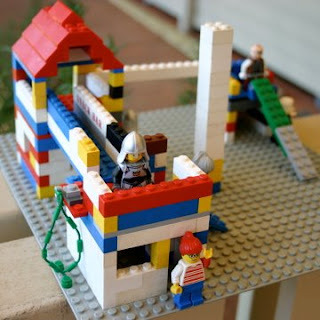 "We do things in bulk," I explained, "Bulk house, bulk children and bulk playground." He grinned a and said, "This'll be fun!" The plans include a fort, swing, slide, climbing frame, sandpit, shop for the girls, bridge - even a watertank to catch the rainwater so the children can waste their own water! The first part is digging the holes and foundation. 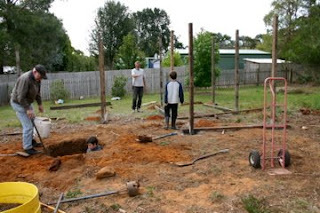 In the picture you can see James digging a very deep hole to secure an old power pole, from which we will attach a flying fox cable, shade cloth and maybe even a flag or two. As Playground 3.0 is developed, we will keep you informed.